I did not realize that yesterday’s Geneve-Rolle-Geneve was a stand alone race and counts in the season championship as a regatta, same value as the first two regattas were we finished 3rd and 5th respectively. 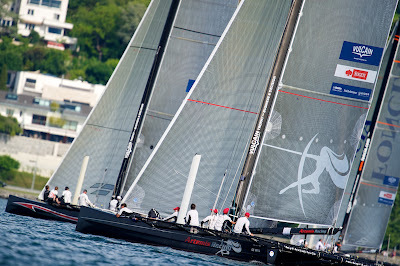 So after yesterday’s 2nd place, Artemis Racing was tied for first place in the season with Foncia and Velti Group. That was pleasant news but there is still a long way to go for the season. Today was the first day of the Sogeti Cup. The wind was very light on Lake Geneva and only two races were held. Onboard Artemis Racing we managed a 2, 7 and are in 3rd place on the leader board for the Sogeti Cup, 2 points behind Okalys and Velti Group. The winds were 6 knots max and mostly 3-4 knots. Still the D35s sail at twice the wind speed so the racing is fast and fun. Torbjorn continues to enjoy the catamaran sailing and is learning fast. Tomorrow racing continues at 1300.